I don't normally make savory muffins. It's not that I have anything against a savory muffin. Some of my favorite muffins are savory! I like nothing better than a cheddar bacon cornmeal muffin with my green tomato chili. I just don't think of savory first when I am preparing to make muffins. 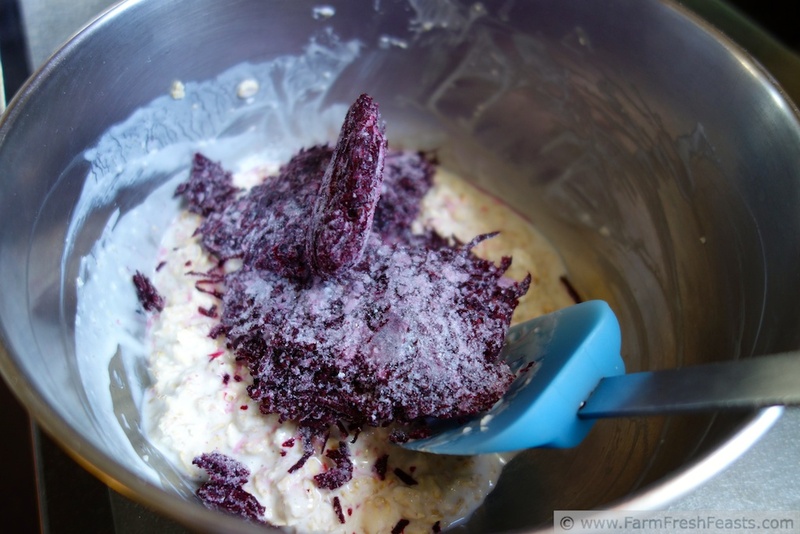 I'd mixed a cup of shredded beets into my soaked oatmeal muffin base, but was dithering over which direction to go from there. Mom was visiting and suggested horseradish. Conveniently, I had a jar of horseradish powder. This savory muffin was delicious served warm with a touch of buttery spread. I'm thinking of using this in a pink-themed Valentine meal--but I'm stumped on the entree. In a large bowl, mix first 3 ingredients. 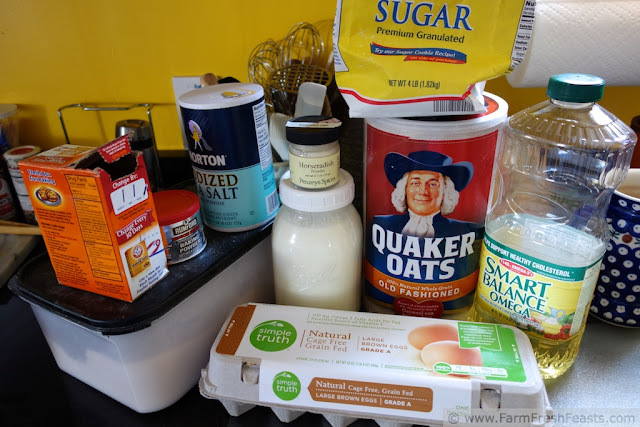 Let sit on the counter for 1-3 hours (or overnight, but I wouldn't care for this muffin hot in the morning, it seems more like a dinner muffin to me) If you like, you can prep the oats and buttermilk step a few days in advance and store in the fridge. When you're ready to bake, preheat the oven to 400 degrees Fahrenheit and spray a 12 cup muffin pan with oil spray. Stir in the egg, sugar, and oil to the bowl until well blended. Dump the rest of the dry ingredients on top and stir until just combined. Scoop** into prepared muffin pan. Bake for 18 minutes. Cool in pan 5 minutes, then turn out onto cooling rack. Try it! This post is linked up with the Wednesday Fresh Foods Link Up at Gastronomical Sovereignty, What's In The Box at In Her Chucks, Strange But Good at Sprint2TheTable, Food On Friday. I love the color of these! And I've never seen powdered horseradish; I'll have to keep my eyes open next time I'm at Penzy's! I think I picked it up on a whim while at Penzey's (I tend to get a lot of whims in that store). I've had jars of horseradish but they end up growing things on top before I can get them emptied, so I was glad to see a powdered version. I love to read blogs while drinking my tea. Borscht might work. I did a pink meal for Valentine's Day once. I made borscht and then blended it into a puree, added a tiny touch of liquid smoke, and cashew creme. 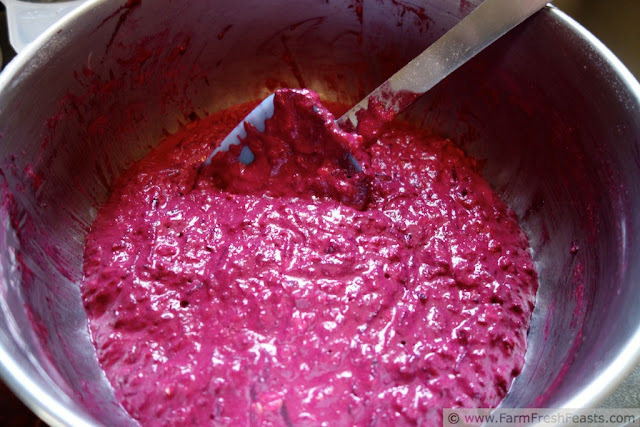 I am vegan so no cream for me...but cream would work just as well...just put the blended borscht back in the pot and heat just a little, add cream and remove from heat before it boils or the cream will separate.It comes out a beautiful pink color. I place the soup in the bowls and then drizzle a swirl of cashew cream in a spiral and sprinkle with chives. Yum! Borscht sounds like a great idea, Elle--thanks! What a vibrant color you get from the beets. The addition of the horseradish will definitely pack a punch. Tough to find an entree that is truly pink. How about salmon? The colors are really wild. 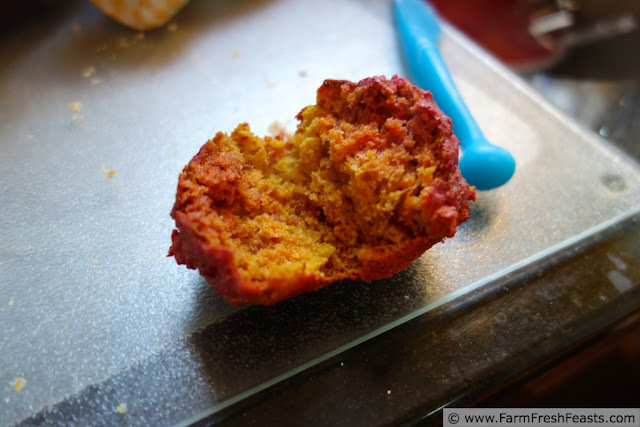 It's funny that the beet pizza stayed pink throughout, but the muffins were more orangey inside. That orangey inside would pair nicely with salmon. Hmm, I think we're cobbling together an entire meal here--Elle's borscht as the first course, with muffins, followed by a salmon entree . . . and all the yummy desserts I've been seeing. Hard to pick just one. Just pinned these! This looks amazing and a great way to jostle me out of my lack of muffin inspiration. Meaning that I want to make some muffins soon but I'm feeling uninspired and indecisive about which ones to make. Thanks! I so understand uninspired and indecisive. Especially indecisive. It's my Kitchen Middle Name. I'm betting the cause of your uninspiration/indecisiveness is squarely due to lack of caffeine, so More Bacon for You! I like dinner muffins...maybe even more than I like breakfast muffins...maybe. I think you need to pair these with a warm bowl of soup or chili. Something appropriate for dunking though because that sounds right and good to me. I hope you are having a great time with your momma. I could dunk a cookie in milk right now . . . though soup or chili would be more appropriate. They will be visiting next month, though, so stay tuned for more of my parents running around my kitchen being photographed cooking for me. Still. Whoa! What a perfect muffin to go with a bowl of warm, cozy soup!! Soup is a great idea--especially with the snowing/not snowing weather we had just today. I don't think savory when I think muffins either... but I absolutely love beets! I bet the horseradish zing is a fun suprise in a bread. Great idea! Thanks, Laura--I could have gone zingy-er (zingier?) but I was playing it safe. As safe as you can play it with a beet and horseradish muffin in the first place. I rarely make savory muffins, but it's mostly because it just doesn't occur to me. I'm loving all of these beet recipes. I'll keep them in mind if my beets come on this summer like I'm hoping they will. I hope your beets grow well this summer! It's always a crap shoot with the garden, and it seems like the plants that do the best are ones I never expected nor counted on to make it. I'm going to use the last of my shredded beets in a carrot cake for my spouse for Valentine's day, then I'll be beet-less until the farm share beets show up in the box. It's true, I am on a beet kick. But all good things must come to an end . . . until the farm share resumes and I get my mitts on more beets! If the start of February here on Farm Fresh Feasts has been shockingly pink due to the beets, March will be a very green month--from Dr Seuss' Green Eggs No Ham to a Tremendously Green pizza . . . These sound so interesting! I love beets and I like horseradish on meats, I may have to try them together! It was sure a strange pairing, but good--perfect for Laura's party at Sprint2TheTable! I've gotten so many pizza ideas there lately. would you quit "beeting" off already, lady?? just kidding! i love it! beet away!! thank you for sharing with us at the wednesday fresh foods link up! i hope to see you again this week with more seasonal & real/whole food posts! xo, kristy. I just now got that. You'd think, with a teen in the house, I would have gotten that a lot sooner. how new and different. I don't think I have ever made savory muffins but I would love to try these. I bet you've made cornmeal muffins--they were my gateway muffin to the savory side. Omg, I LOVE beets....AND horseradish! I have GOT to make these! Do you think I could sub in the same amount of prepared horseradish for the powdered stuff and be ok? My guess is that it would be like dried vs fresh herbs, that you'd use more prepared horseradish and less powder, but I trust your judgement. Let me know!